As the name suggests, a leave-in hair detangler is meant to keep your hair tangle free without weighing them down. Plus, they make your hair soft and smooth. Commercially available leave-in detanglers, however, can be quite expensive, especially if you use them daily. Thus, you can prepare natural detanglers at your home itself. Besides, you can apply pre-shampoo conditioners or simple oil treatments on damaged and tangled hair before shampooing. Another easy way to do away with tangles is to rub a few drops of extra virgin olive oil, coconut oil, or even baby oil between palms and then apply on damp hair. 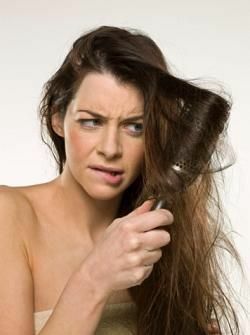 When combing tangled hair, start from the lowest point of the knotted areas. Grab a small section, try to loosen the knots with your fingers, and then use a wide-toothed comb. In case there is static cling in your hair then just rub a dryer sheet over your hair to soothe the cuticle and reduce flyaways. In addition, you can use a solution of three cups of warm water mixed with three tablespoons of liquid fabric softener. If you want to avoid tangles as far as possible, consider using combs or brushed having natural bristles; steer clear of those made from hard plastic or metal. • Take a clean spray bottle and fill 2/3rd part of it with water and the rest with a conditioner that is suitable for your hair type (dry, oily, or combination). Shake the bottle thoroughly and spray the solution liberally before combing to help detangle your hair. • Heat a cup of distilled water for about five minutes (over low heat) and add two teaspoons of unscented conditioner base, half a teaspoon of sweet almond oil, a quarter teaspoon of apricot kernel oil, and ten drops of rosemary essential oil in it. Stir the mixture and allow it to cool. Finally, pour it in spray bottle. As this is a leave in detangler, you need not rinse your hair after spraying this solution. It is suggested to shampoo your hair before applying this recipe. • Boil a quarter cup of dried marshmallow root in 1.25 cups of distilled water for almost 15 minutes to half an hour to get a thick decoction. Let it cool. Strain the liquid and add a tablespoon of apple cider vinegar and half a tablespoon of jojoba oil in it. You may also add a few drops of any essential oil of your choice. Here’s a video explaining how infusions of marshmallow roots and flax seeds can help detangle hair. • Simmer 15-20 dried hibiscus flowers in a pot filled with hot water. Strain the solution after five minutes and add three tablespoons each of dried marshmallow root and dried burdock root. Stir and cover the pot for about 15 minutes. Use this hair care recipe as an effective leave in detangler and conditioner that adds sheen to your curly hair. It stimulates hair growth as well. • Rinsing your hair with a quart of warm water mixed with a tablespoon of lemon juice and a teaspoon of honey can prove beneficial in avoiding tangles naturally. • Mix 10-15 drops of grapefruit extract, one teaspoon of aloe vera gel, two drops each of glycerin and lavender essential oil in eight ounces of distilled water. Use this solution as an effective detangler for your tresses. Having prepared your homemade leave-in conditioner or detangler, you can store it in a hair spray bottle or a squeeze bottle. If you do not have a spray bottle, take some solution in your palm, and use it on your hair with the help of your fingers.